Thingyan water festival in Myanmar: snacks that will make you want to come back! No one dares to refuse that Thingyan festival is the most joyful out of the many festivals in Myanmar. Thingyan festival normally falls on the 13th of April and lasts 4 to 5 days, which are followed by the advent of New Year. Out of so many interesting things during Thingyan festival, the one that many Myanmar loves the most is to eat its traditional treats. Thingyan would not be perfect without the enjoyment of eating festive snacks. 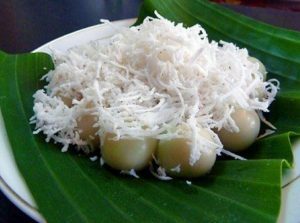 Another popular treat is called “Mont Let Saung” (မုန္႔လက္ေဆာင္း). 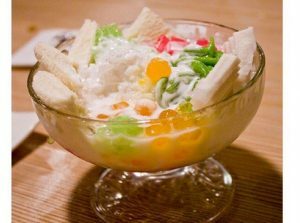 It is also rice-based and we use the same ingredients as in Mont lone ye paw, but the preparation is somewhat different. The rice paste is made into small drops and the finished products resemble droplets of rain. These droplets are served together with syrup made from the jaggery and water. Some regions of Myanmar have their own recipe, for example, Mawlamyine area put durian to accentuate the aroma and the flavor. Preparing those snacks for Thingyan needs a lot of organization, since those snacks are usually made in enormous quantity for everybody to enjoy freely! Most if not all shops are closed during Thingyan, so it’s always good to have free food at hand. Usually girls from the group have the task to make the round dumpling while young men are recruited to do the heavy chores such as lifting the pots, carrying water and washing the plates. But this group work is usually a very happy moment, since it announces very festive times and most of the time music is played, either live or recorded. Most of the pandals around the cities prepare these snacks for all four days of Thingyan festival. It is a standing custom to offer Thingyan treats to whoever comes to the pandals where water is poured on the revelers. Don’t be shy to ask Thingyan treats if you feel hungry in front of the pandals. You will be happily treated. 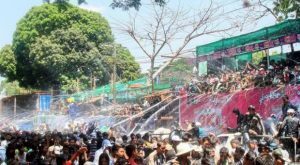 Thingyan is a water festival of Myanmar that happens every year before Burmese New Year. Pouring water and being watered in Burmese tradition is believed to wash away bad luck and sins from the finishing year, to enter free and clean in the New Year. On New Year’s Day, which normally falls on the 17th of April (according to the Gregorian calendar) all the water-throwing and treating traditional snack ends. Releasing fishes into the water and birds into the sky as an act of merit celebrate this day, and special feasts are also held for the Buddhist monks. So, if you want to enjoy the festivities and the traditional snacks, you can do so only during Thingyan festival before New year Day. Don’t miss the endearing and delicious treats of Myanmar Thingyan Festival.